I'm a 25 year old Singaporean who is currently a student with Auston School of Management & Technology pursuing a Bachelor of Arts (Communications) with a double major in mass comm & marketing which is offered by Upper Iowa University. Prior to this I was also a student at Auston, but doing the Advanced Diploma in mass comm. Before that I was working at Conrad Centennial Singapore as part of my SHATEC Diploma in Hotel Management course. In order for us to graduate, we had to be attached to a hotel for a year. Below is a pic of myself & Dawn (my "sister") who was working as a temporary Guest Service Agent during my stint at Front Desk. This photo was taken in May/June 2001 on Dawn's last day at the hotel. She can really sound like a kitten meowing, so her nickname is Meow! I'm quite a lazy person so not much outdoor activities for me. My hobbies include surfing the internet, playing computer games (especially shooters like Rainbow Six: Raven Shield & Ghost Recon), watching TV, reading comics & military related books (e.g. Defending The Lion City), watching movies & going out with friends. I love listening to music too especially to songs by S.H.E (Hebe Tien is so cuuute!). I'm also a fan of Linda, Jaime Teo, Elva Hsiao, Stella Ng, Stefanie Sun & Lu Rui En. Since I don't have much to say about myself, I intend to use this very page to sell my 2nd hand pet stuff too. 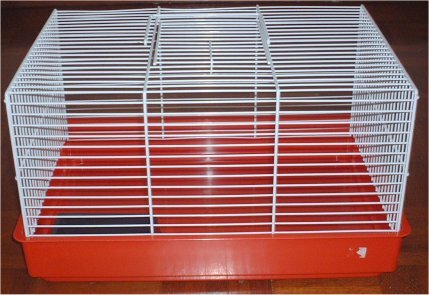 So far I only have one pet item for sale & its a cage measuring 45 X 28 X 21 cm (L X W X H). Its meant for hamster/gerbil but can house 1 baby guinea pig too. Alternatively you could use it to transport 1 adult cavy to the vet/groomer. Comes with plastic food bowl. Seldom used & in good condition. Selling for $30 (negotiable) & its cash & carry from my house. If you're interested in other second hand stuff that I have on sale, kindly visit my other website which is solely for displaying second hand goods I have on sale.